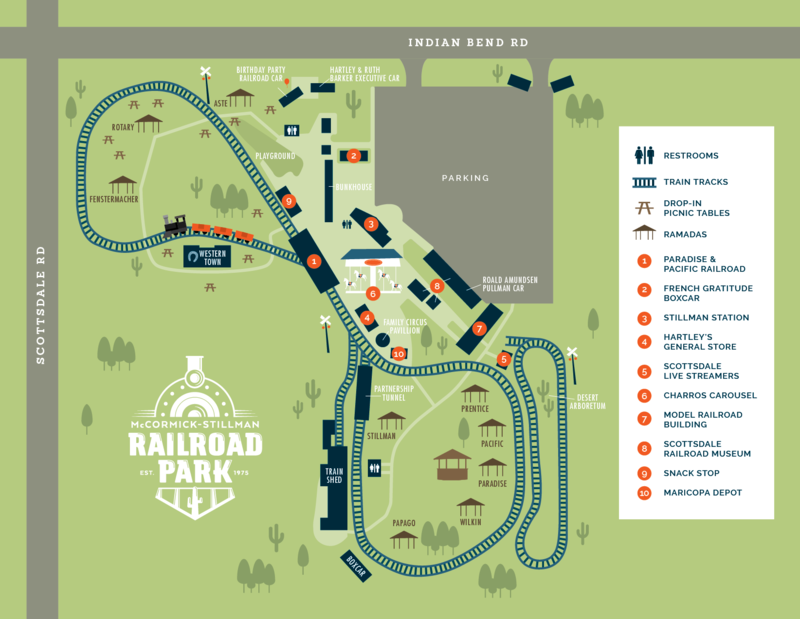 There is no admission fee to visit the McCormick-Stillman Railroad Park. Tickets to ride the train and carousel are $2.00 each, with children two and under riding free. Children under the age of 13 also get free admittance to the Scottsdale Railroad Museum with a paying adult. Tickets can be purchased at Stillman Station. Visit Hartley’s General Store for an iced coffee, ice cream cone or hot dog. Hartley’s is housed in the historic Aguila Depot, which was acquired and moved to the park in the late 1970s. The park is open 363 days a year, only closing on Christmas Day and Thanksgiving. January 10:00 a.m. - 5:30 p.m. 10:00 a.m. - 5:30 p.m.
February 10:00 a.m. - 6:00 p.m. 10:00 a.m. - 6:00 p.m.
March 10:00 a.m. - 6:30 p.m. 10:00 a.m. - 6:30 p.m.
April 10:00 a.m. - 7:00 p.m. 10:00 a.m. - 7:00 p.m.
May 10:00 a.m. - 7:00 p.m. 10:00 a.m. - 7:00 p.m.
June 9:00 a.m. - 1:00 p.m. 9:00 a.m. - 7:00 p.m.
July 9:00 a.m. - 1:00 p.m. 9:00 a.m. - 7:00 p.m.
August 9:00 a.m. - 1:00 p.m. 9:00 a.m. - 7:00 p.m.
September 9:00 a.m. - 1:00 p.m. 9:00 a.m. - 6:30 p.m.
October 10:00 a.m. - 6:00 p.m. 10:00 a.m. - 6:00 p.m.
November 10:00 a.m. - 5:30 p.m. 10:00 a.m. - 5:30 p.m.
December 10:00 a.m. - 5:30 p.m. 10:00 a.m. - 5:30 p.m.
October - May 10:00 a.m. - 4 p.m.